University of Waterloo researchers help cities listen for water pipe leaks using artifical intelligence (AI) equipped fire hydrants called hydrophones. “They could be more proactive as opposed to reactive,” Roya Cody, lead researcher, said. 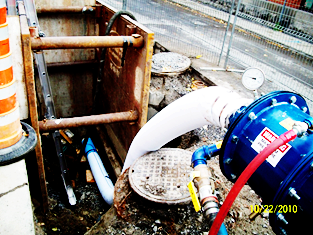 Small leaks in municipal water pipelines often run for years without detection. Cody’s team plans to catch leaks as they appear using the hydrophones. Hydrophones use machine learning algorithms to pick up the acoustic signature of water leaking out of pipes. Hydrophones placed inside water supply pipes monitor flowing water by listening for the tell-tale sounds of leaks. These inexpensive sensors are installed through municipal fire hydrants without affecting the hydrant’s functionality. Water pipe leaks account for huge losses of water. Over 13 per cent of water in Canadian municipal water systems is lost due to leaks, bursts, and the resulting problems. The amount of water wasted increases in municipalities with less developed pipelines. “[Hydrophones] would allow cities to use their resources for maintenance and repairs much more effectively,” Cody said. The project also reduces health hazards and saves municipalities from incurring additional costs. Unsafe contaminants enter water supplies through leaks in water pipes, and continuous leaking also deteriorates buildings and infrastructure over time. “By catching small leaks early, we can prevent costly, destructive bursts later on,” Cody said. Tests run inside the lab using PVC pipes and fire hydrants detect leaks as little as 17 liters per minute. Leaks of this size generally go unnoticed. The research group has moved on to in-field testing. The team hopes to work out how to determine the exact location of leaks in this phase. Their work will allow municipalities to identify and prioritize repairs. While catching pipe leaks early is certainly important, fixing them is equally so. With the recent cold snaps and dropping temperatures, more water main pipe leaks and breaks are expected in the Waterloo region. The colder, more sustained temperatures drive frost lower into the ground, where the pipes are. This can cause movement of the placement of the pipes as well as contraction of the metal pipes, which will later expand when the weather warms. A think-tank at the University of Waterloo has come up with a new innovative solution for fixing these water pipes called cured in place pipe (CIPP). “We are building new pipes inside the old pipes using the old pipe as a form,” Mark Knight, a member of the think-tank, said. This concept involves shooting a lining into the existing pipes, curing it so that it hardens into a new pipe inside the old pipe. This is not considered a band-aid solution but an actual long-term sustainable solution. The City of Waterloo has 400 km of piping made up of mostly cast iron or ductile iron piping, which typically have a life of about 100 years. “This means that they need to replace about four km per year,” Knight said. While this would add about 100 years to the life of the pipes, it is a costly procedure. However, it is important that cities remain proactive about their water pipes. Otherwise, there will come a time when they will be forced to act and replace the pipes, regardless of finances. “We are also developing tools to help water utilities development programs and to get funding to fix these aging and deteriorated water pipes,” Knight said.